requirements: Open to legal US residents 18 and older; One entry per household. To join: If you're already part of the Enfamil Family Beginnings® program, sign in here to view your profile. 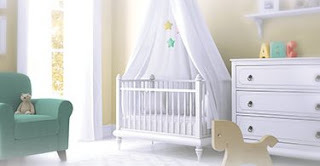 You’ll be prompted to opt into the Sweet Dreams Nursery Sweepstakes for a chance to win $4,000 for your dream nursery! During the Promotion Period, to enter the Promotion, include your name, address, phone number, age, and the subject line “Sweet Dreams Nursery Sweepstakes” on a piece of paper and mail it in an envelope with proper postage to Mead Johnson & Company, LLC, 2400 West Lloyd Expressway, b-507, Evansville, IN 47721-5095 U.S.A., Attention: Enfamil Family Beginnings® Sweet Dreams Nursery Sweepstakes.